Imagine three stunningly beautiful turquoise coloured lakes bordered by pine forests. A tranquil retreat where you can swim, fish or picnic on the lake shore. Hardly sounds like a typical Andalucian scene, does it! But west of Alora that is what you will find. Malaga's "Lake District" is in fact three artificial lakes created by a dam built across the dramatic 200 metre high Guadalhorce river gorge, known as the Garganta del Chorro. Watch out for the eagles which continually circle around the sheer cliffs. From your journey through the Valle de Abdalajis you will arrive at the small village of El Chorro and your first sight of the dam and gorge area. There is a small bridge across the middle of the gorge, built during the construction of the reservoir between 1914 and 1921. The dam was officially opened in 1921 by King Alfonso XIII of Spain and, on this occasion, he took a walk along the specially constructed catwalk pinned to the face of the gorge some 100 metres above the river. 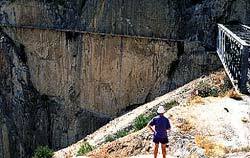 The very brave (or stupid) can still walk along the "Camino del Rey" (The King's Path), but take care as it is in a very bad state of repair. You can find the "King's Path" by driving across the lower dam into the village of El Chorro, take the track on the left before the railway station, continue past the camp site until you can drive no further. Walk the last few hundred metres. The path drops down and skirts the iron girder railway bridge (take care crossing the line, Von Ryans express was filmed here). Now decide for yourself whether to follow the King's footsteps. To reach the lakes, drive over the dam and follow the road round to the left of the gorge. Just keep on this road and you will come to the lakes after about a 4 km drive. Even though the lakes are very popular in the summer, their shores are so vast that it is easy to find a quiet place to sunbathe, swim and picnic. We recommend a delightful waterside restaurant 'El Kioskoll', a particularly good choice for a winter visit as a blazing log fire and their excellent roast lamb and pork go down well after a walk along the shores of the lake. But equally delightful is their summer terrace with views of the lake. To find 'El Kioskoll' continue east along the lakes, through a tunnel under a lakeside restaurant and cross over another dam. You will find 'El Kioskoll' on the right hand side of the road.